A little over half way through the season, The Canucks are pretty much where most expected them to be. They sit 7th in the Western Conference, and 11th in the NHL. Their Corsi For %, (5 on 5, score close) is 10th, and their goal differential is 11th in the NHL. They've endured some lengthy injuries that has challenged their depth, uncovered some gems in Mike Santorelli and Ryan Stanton, and received quality goal tending from the question mark that was Roberto Luongo heading into the season. So, they're pretty much where they're "supposed" to be. And yet, anyone following the team has witnessed the gut-wrenching ways they have lost games this season and wondered what the real identity of this group is. They've outplayed the opposition on most nights, but they've given up goals in rapid succession, in the dying seconds of periods, blown leads late, and often. When leading after two periods, the Canucks are only 15-2-2 (.789) this year. That's good for 22nd in the NHL. The teams ahead of the Canucks in the West are 122-2-11 (.904). However, before you blame John Tortorella for this mess, his Rangers were 16-0-0 last year in those situations. Also remember that the Canucks were only 18-2-3 (.783) last year under Alain Vigneault, and also blew two games against San Jose in the playoffs while leading with under five minutes left. These stats do not even tell the full picture however, as many leads generated early in the third period this year have also been squandered in the waning moments. In fact, when the Canucks are leading in the second half of the third period, they've managed to forfeit 10 points of their own, and given Western Conference teams 10 points back. Funny enough, that’s pretty similar to their performance over a 48 game schedule all of last season, when they forfeited 7 points of their own, and gave 11 points back to Western rivals. How do those numbers compare with division rivals Anaheim, Los Angeles, and San Jose this season? 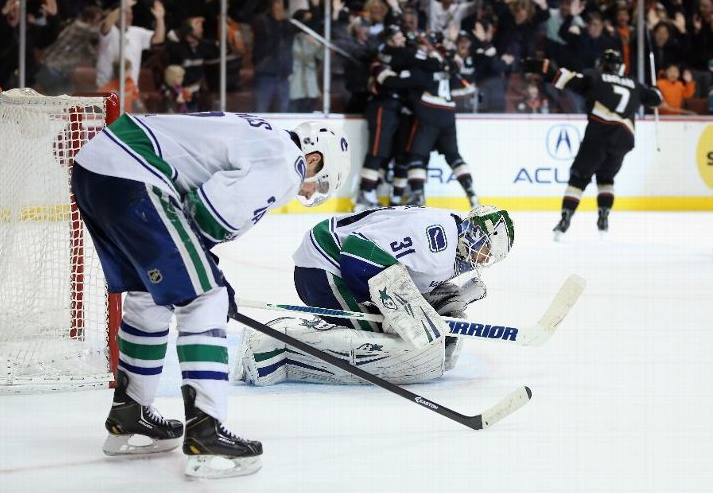 If that wasn’t enough, the Canucks have also managed to give up goals in the dying seconds of the 2nd period on numerous occasions this year as well (St. Louis, Detroit, Phoenix, Anaheim, Tampa Bay). Those back breakers resulted in a 1-3-1 record, giving division rivals 5 more points. For some, it may not matter when these goals go in, or how these losses occur, because the Canucks are probably where they deserve to be in the standings. However, this is clearly a trend that extends beyond the last month and a half. The Canucks have been unable to close games for the past two seasons.